This Flash simulation demonstrates how vectors are used to represent velocity. 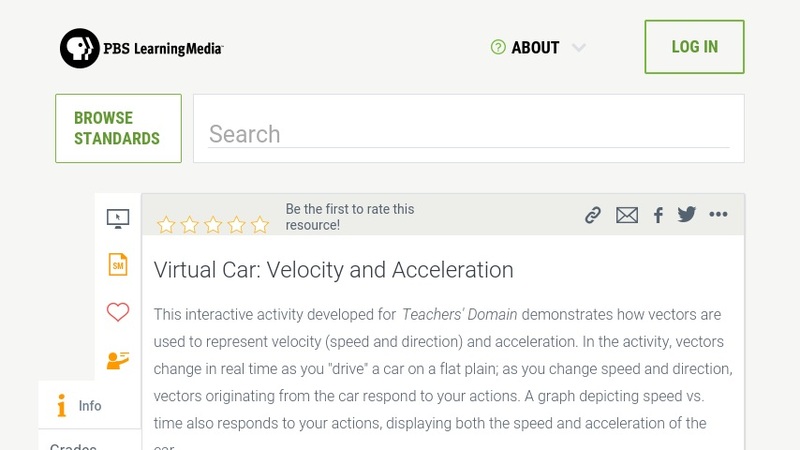 As students drive a virtual car on a flat surface, vectors change in response to the changes in speed and direction. A graph of speed vs. time is displayed in real-time as the car is maneuvered. This resource can be adapted for use in middle school, Physics First, and conceptual physics courses. Background information and discussion questions are also provided. Teachers' Domain is an NSF-funded network partner of the National Science Digital Library (NSDL). It is a growing collection of more than 10,000 free educational resources compiled by researchers and experienced teachers to promote the use of digital resources in the classroom.